I've got a little box of rodenticide behind a filing cabinet at my desk here at the old office. I didn't put it there. Facilities did, years ago. What is odd is that the mouse that frequents this area of the floor seems to really love the space behind the cabinet with the rodenticide. I see him a few times a day scooting across the way under a different rack of grey metal filing cabinets. It's pretty exciting. Really. It's a fantastic diversion. I'm just glad it's not a glue trap behind my desk. I don't especially want to drown a squealing mouse. Speaking of rodenticide, though the one time I've told this story, I was disbelieved, two nights ago, as I was waiting on the subway platform, I watched the rats scurry around, as I am wont to do. In the past I've wondered why these things never seem to get hit by trains. The trains are damned fast and the rats show even less fear of the trains than they do of humans. Well, one of the little scurriers that caught my eye seemed to be gnawing on something especially tasty. I looked away, looked back, and realized that he was not hunkering over a discarded cheesesteak but a much larger relative of his. I walked over to get a closer look, and the big rat's head was partially flattened. I can only speculate that it somehow got its pointy face up on the track at a very inopportune moment. I tried to tell myself that maybe the little guy at his side was trying to revive him. But the fact that the living rat was so obsessed with his dead comrade's crushed head was too much to ignore. It was clear. The rat was feasting on the flesh (presumably brain matter) exposed when this monster rat met his maker. There are a ton of pests in this city, no doubt. And they're all in this area. Shopping. Then there are the rats. Man, that's a poor excuse for humor. I must still be shaken from the ratibalism I witnessed. 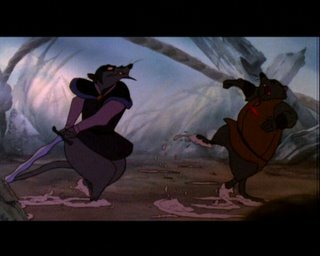 The secret of Nimh? Soylent Green of course. I think that's a really good excuse for humor. Rats may eat each others' brains, but they have the decency to do it in low-lying places. They aren't parading through the streets with shopping bags -- if they go through the streets, it's usually in a fast diving motion, as though they're ashamed of who they are, because they know they're brain-eaters.